Random amplified polymorphic DNA (RAPD) and genomic in situ hybridization (GISH) methods have been used to verify the hybridogenic origin and to identify the parental species of some ornamental cultivars in the subgenus Melanocrommyum of the genus Allium. The cultivars had been selected from seed obtained after uncontrolled pollination in breeders’ fields. 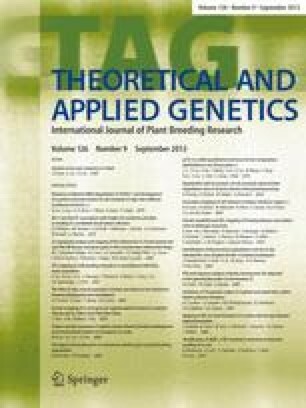 The combination of GISH analysis with RAPD markers is very suitable for testing the hybridogenic origin of plants and to ascertain the parental species of the hybrids in such cases. As suspected, A. macleanii and A. cristophii are the parental species of ‘Globemaster’. The parental species of cultivar ‘Globus’ are A. karataviense and A. stipitatum, and not A. cristophii and A. giganteum as has been assumed on morphological grounds. Cultivars ‘Lucy Ball’ and ‘Gladiator’ are of hybrid origin, though only one of the parental species, A. hollandicum, could be confirmed. The cultivars ‘Purple Sensation’, ‘Mount Everest’, ‘White Giant’, ‘Michael H. Hoog’ and ‘Mars’ are not hybrids since neither GISH nor RAPD suggest the presence of a second genome. ‘Purple Sensation’ belongs to A. hollandicum, ‘Mount Everest’, ‘White Giant’ and ‘Mars’ to A. stipitatum,‘Michael H. Hoog’ to A. rosenorum.